Indie rock band Walk the Moon will headline University Union’s second Bandersnatch Music Series show of the semester on Wednesday, Dec. 5. Brooklyn duo Ghost Beach will open the show, to be held in the Schine Underground. Doors open at 7:30 p.m. and music starts at 8 p.m. 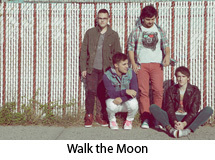 Walk the Moon, from Cincinnati, released its self-titled debut album in June. The band’s infectious, danceable sound is showcased in the single “Anna Sun,” which peaked at No. 10 on the Billboard Alternative Rock Charts. The band has played major music festivals, including South by Southwest and Lollapalooza in 2011 and Sasquatch Music Festival and Firefly Music Festival in 2012. It has appeared on “Late Night with Jimmy Fallon,” “David Letterman” and “Conan.” Walk the Moon members are known for painting their faces before live shows and bringing more paint to share with the audience. Ghost Beach’s tropical grit pop sound has been garnering online media attention since 2011. It has independently released a new track on its website each month and its debut self-titled EP dropped in January. This past week Ghost Beach played at CMJ Music Marathon, an annual festival held in New York City and hosted by CMJ Network Inc., a music events and publishing company. Tickets are available for purchase at the Schine Student Center Box Office, and are available for all SU and SUNY-ESF students and staff for $5 ( limit of two tickets per person). A valid college or staff ID will be required to purchase tickets. For more information and general questions, contact Sarah Fleisher, director of public relations for University Union, at press.uu@gmail.com.